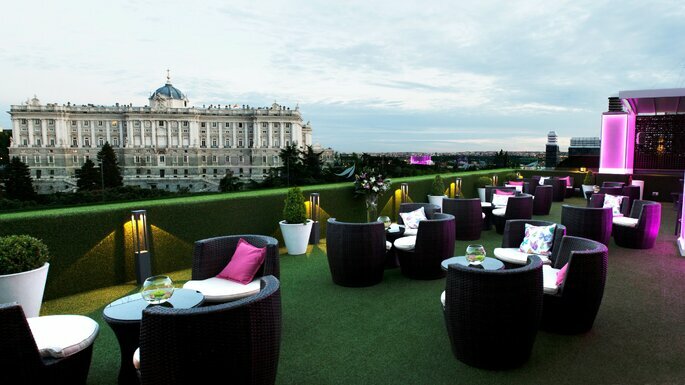 As they say, Madrid is best seen from above where you can take in its stunning skyline. 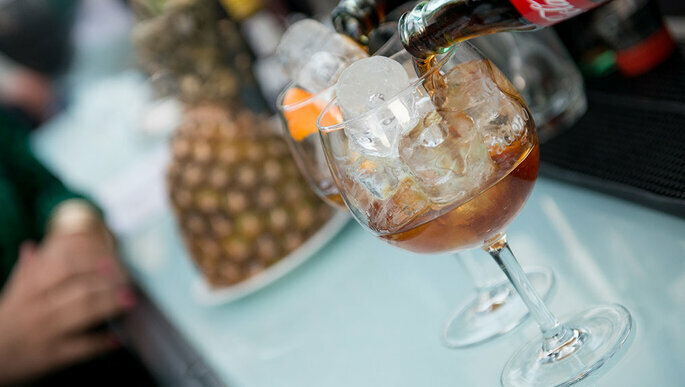 So, we’ve put together a collection of some of the best ‘terrazas’ in Madrid where you can go to enjoy a romantic drink with your other half. Even though we’re now coming into Autumn, these terraces are still the perfect place to spend the evening together. 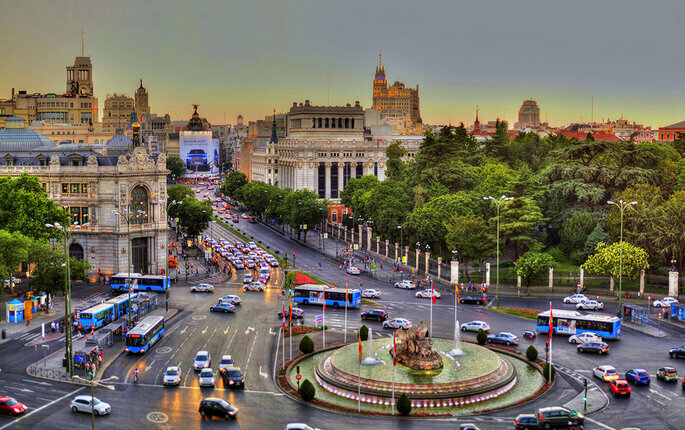 The Palacio de Cibeles is one of the most famous spots in Madrid with incredible views over the Cibeles fountain. From the highest heights you will see all the classic postcard pictures brought to life, all from the comfort of a rooftop. 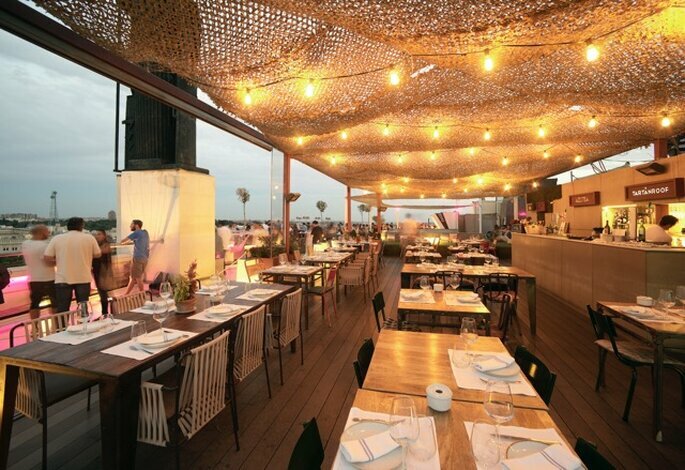 Enjoy a meal together and continue the evening with a couple of cocktails whilst looking out onto the city at night. 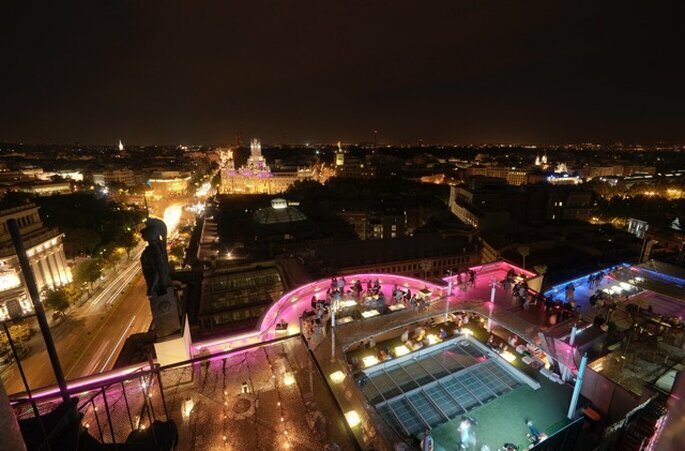 As it is located on the rooftop, you can enjoy some of the best panoramic views of the capital from Azotea. This terrace is open every day of the year and at any time. Its restaurant, Tartan Roof offers cutting-edge cuisine and classic cocktails which you can enjoy from the comfort of the spectacular Balinese bed. Azotea is the perfect place to come and enjoy the end of an autumnal day with some great company and a couple of drinks. 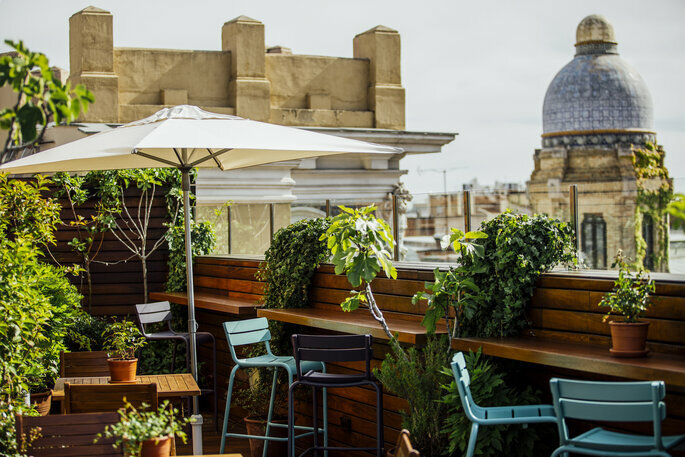 This terrace belongs to the boutique hotel ‘Oscar’ located at the top of the modern hotel in Chueca. 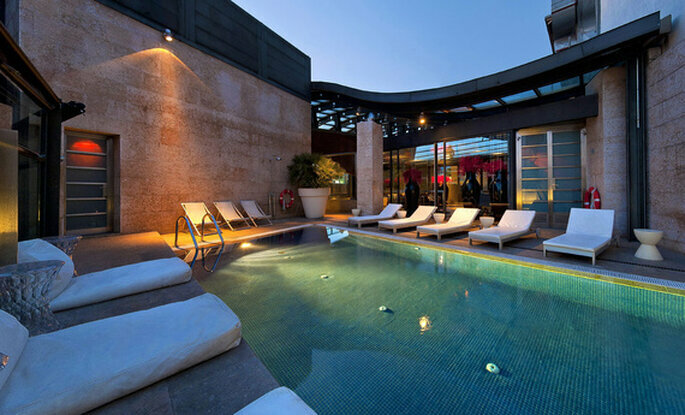 This roof terrace has a pool – perhaps the one of the best in Madrid! The terrace’s modern design and feel, with everything in white, evoke a sense of calm and relaxation – perfect for couples looking for some quiet, quality time together in or out of the pool with a cocktail in hand. Don’t worry, with a snack menu you can enjoy an afternoon or evening up top without going hungry. This urban ‘resort’ houses many things, including a gym, a theatre and a spa, but right at the top it also has a wonderful roof terrace. 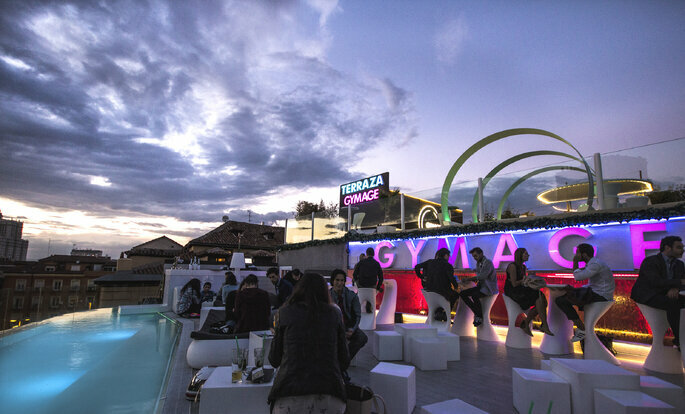 It has a modern and fun vibe, with a pool during the summer months, and is the perfect spot to head to if you’re looking for somewhere to kick back as a couple. Open all year round, and with its optional glass roofing system, you can enjoy the terrace no matter what the weather’s doing! 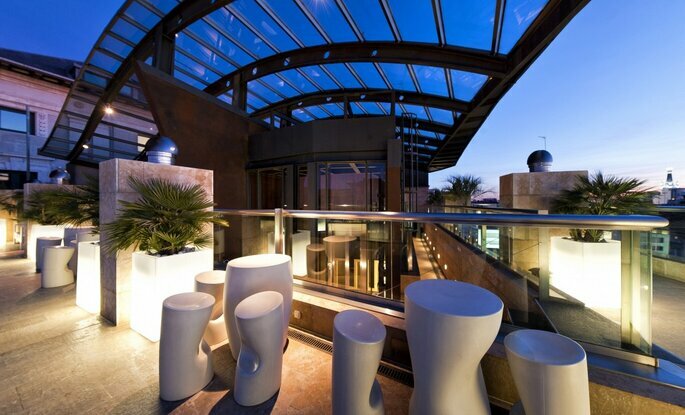 Head up to this magnificent terrace on top of the hotel. 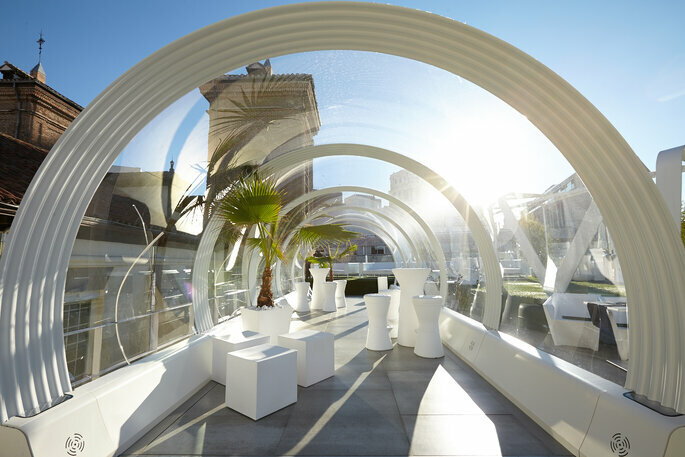 Although the terrace has been designed with a modern and trendy feel, its views of Madrid de los Asturias and of the Palacio de Oriente are certainly classic and won’t be forgotten in a hurry. Whilst perfect for enjoying a meal or a few drinks in the evening, this terrace is also open for brunch at the weekends with tasting menus inspired by traditional dishes from Asia, America, Africa and Europe. Head on up there and try some new and exciting dishes! 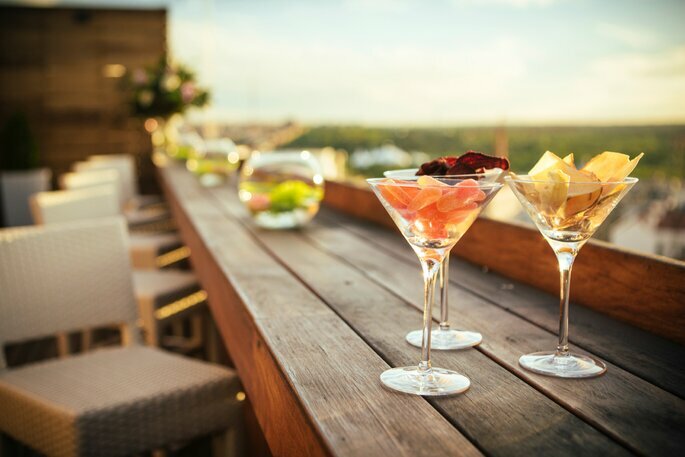 The terrace at the top of this hotel (known for its gourmet cuisine) is designed for proper relaxation and comfort and is the ideal spot for enjoying a chilled out drink from their huge list of cocktails – we can guarantee that there’s something for everyone! If you’re feeling particularly zen, why not pop up to the terrace on a Tuesday or Friday morning for a morning yoga class along with plenty of healthy drinks on offer too! 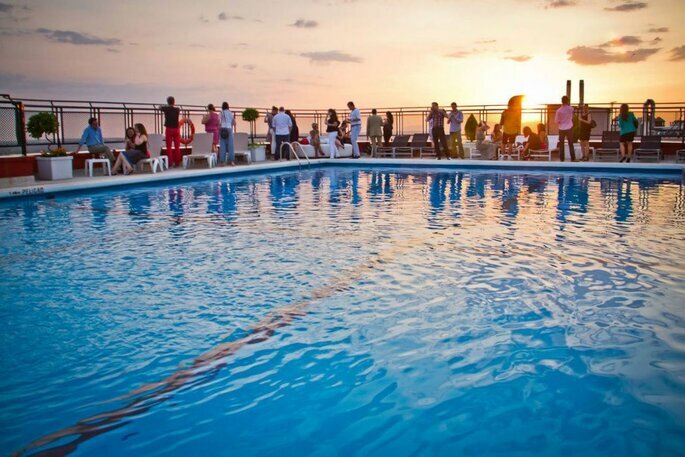 The Hotel Emperador is known for its wonderful terrace complete with pool, garden and sunbeds. It really is a slice of paradise away from the hustle and bustle of the city. 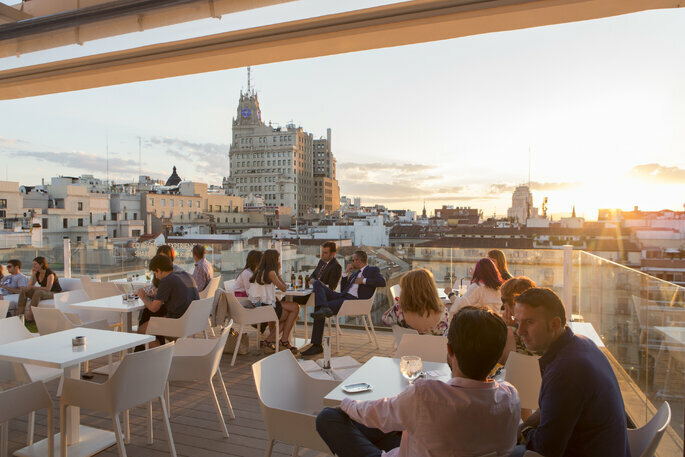 On the tenth floor in the middle of Gran Vía, this urban oasis offers a real chance to kick back and relax and take in the panoramic views of the Madrid skyline. From 11am until 8pm the space is also available for hire for private events. Enjoy a wonderful morning or afternoon from above! 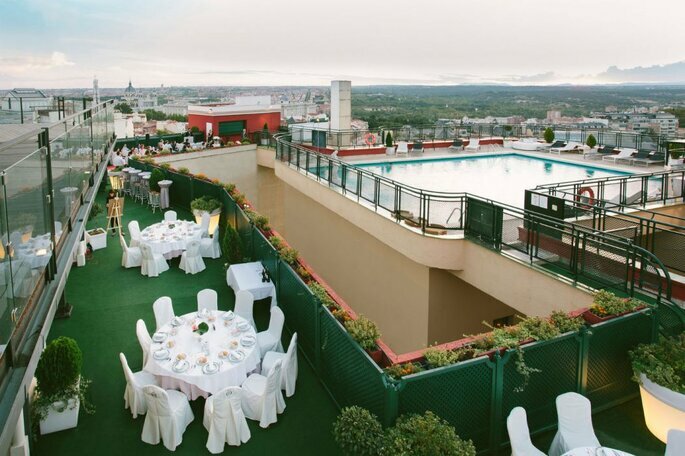 Considering getting married in Madrid? Check out our mini-guide here. 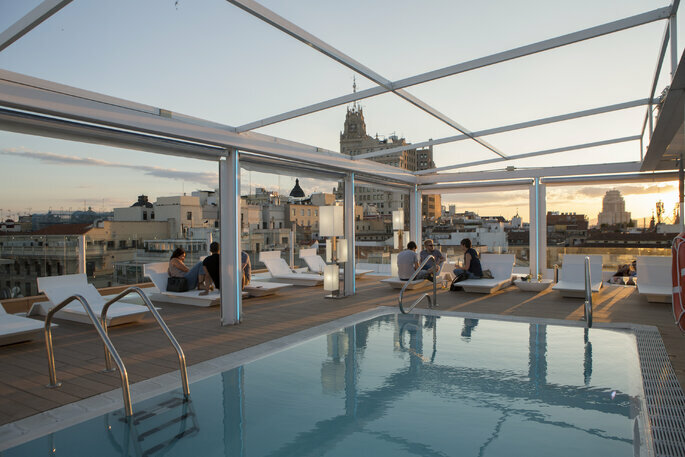 To find out more about Madrid’s Westin Palace Hotel, click here. and here.